tawa paneer masala recipe with step by step photos – this paneer recipe is one of the easiest and quick paneer recipe to prepare. a semi dry curry which can be cooked in less than 30 mins. so easy that you can make these when you have unexpected guests at home or you want to cook something easy for dinner after a day’s hard work. the best part is you can easily serve the tawa paneer masala with a whole wheat bread or brown bread or dinner rolls. you don’t need to make chapatis or parathas. of course you can make chapati or parathas, if you have time and are not too tired. few other quick and easy paneer recipes on the blog are kadai paneer, paneer butter masala, paneer bhurji, paneer makhanwala, paneer do pyaza and quick paneer tikka recipe. the entire recipe is made on a tawa/tava – a concave shaped round pan (shown in the step by step pics below) used in indian homes for making various indian flat breads like rotis and parathas. even dosa and cheela (gram flour crepes) are made on the tawa. they are also used for shallow frying snacks like aloo tikki and for dry roasting spices, nuts and seeds. a few vegetarian recipes made on tawa are tawa pulao, pav bhaji, tawa vegetable masala. another paneer recipes made on tawa is paneer khurchan recipe. if you don’t have a tawa, then you can easily use a frying pan or a medium skillet. if using a tawa, then use a medium sized or a large tawa, so that the food does not spill from the sides while cooking. to make this recipe, you will need paneer/cottage cheese, capsicum, onion, tomatoes and the regular indian spices-herbs. i have made a puree of the tomatoes. however, you can just finely chop them and add to the dish. 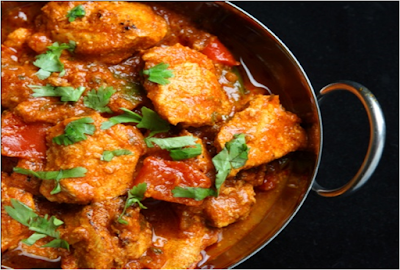 while serving paneer tawa masala, drizzle some lemon juice on top and garnish with coriander leaves. accompany with some onion ring salad or an indian vegetable kachumber or salad. 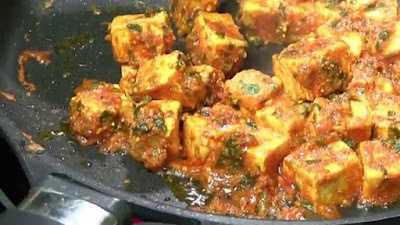 if you are looking for more paneer recipes then do check malai paneer, paneer makhani, palak paneer, kadai paneer gravy, paneer jalfrezi, achari paneer and paneer tikka masala. Tawa paneer masala recipe - a semi dry curry with capsicum/bell pepper, onions, tomatoes and paneer cubes cooked on tawa or a griddle. a popular restaurant side dish. finely chop the onions and capsicum/green bell pepper. roughly chop the tomatoes, green chili, ginger and garlic. crush the ginger and garlic in a mortar-pestle to a paste. add the chopped tomatoes in a blender and make a smooth puree. keep aside. 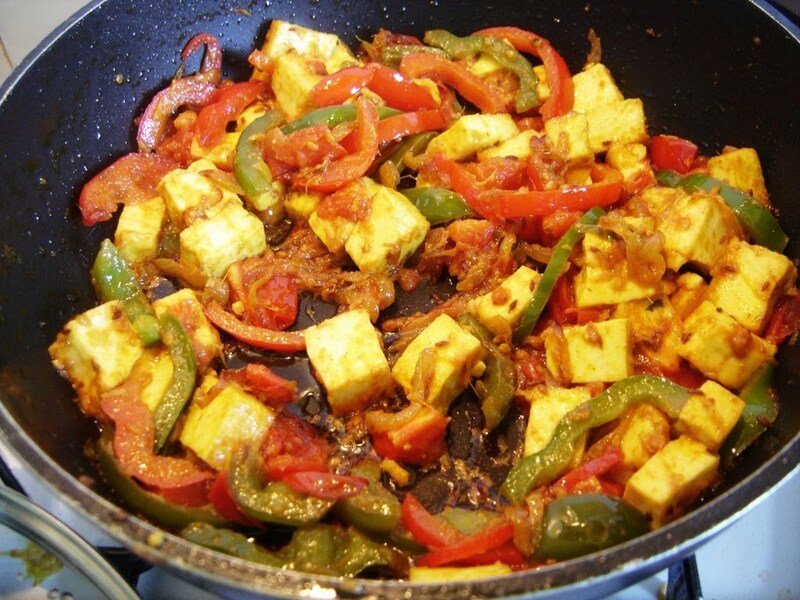 chop the paneer in ½ inch cubes. melt butter on a tawa or skillet. add the carom seeds/ajwain and fry them for a few seconds or till aromatic. add the onions and saute till translucent. add the ginger-garlic paste, green chilies, finely chopped capsicum/green bell pepper and saute for about 3 minutes. then add the red chili powder, turmeric powder, coriander powder and pav bhaji masala. if you don't have pav bhaji masala, add garam masala + amchur powder/dry mango powder. stir and saute for about a minute. then add the tomato puree and salt. stir well and saute till you see butter releasing from the sides and the masala has thickened a bit. this takes about 8 to 10 minutes on a low flame. if the tomato masala looks dry, then add 1 or 2 tbsp of water and continue to saute. add the paneer cubes and stir well, so that the masala coats the paneer cubes evenly. cook the paneer for 1 to 2 minutes. then add the crushed kasuri methi/dry fenugreek leaves. stir very well and switch off the flame. garnish with coriander leaves and serve tawa paneer masala with chapatis, phulkas, naan or bread. accompany with a few wedges of lemon slices which can be drizzled on the tawa paneer and a side onion salad. For More: Tips on Indian &Chinese Recipe follow and like us on Twitter & Faeboook.